Call me paranoid – BUT! Experts say the devices will enable patients to live independently for longer without going into care, and prevent avoidable admissions to A&E….. It has often been claimed that smart meters will enable big brother to spy on us, and it has long been denied by govt that this is even possible. Personally, I always try to steer away from such conspiracy theories. However, this latest report reveals that the technology is there to do just that. 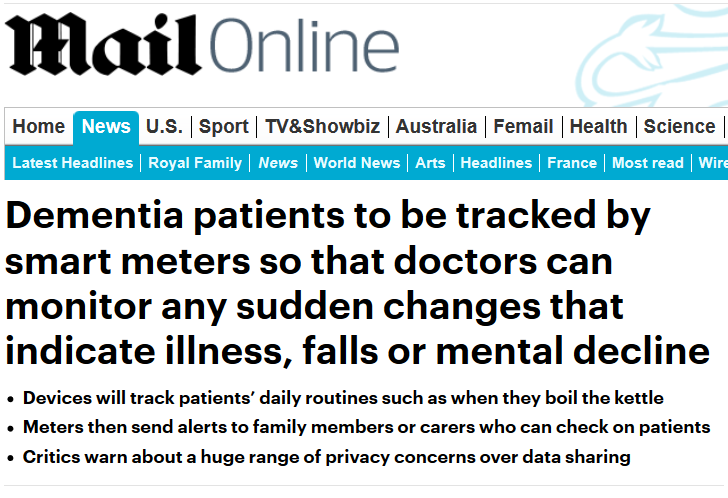 Monitoring of dementia sufferers may, or may not, be a good thing (though I would have thought a few simple CCTV cameras, linked to relatives’ smart phones, would be far simpler and more effective. But how long will it be before the same technology is used to check not only how much power we are using at peak times of the day, but what devices it is being used on? And how long will it be before the grid police cut off our power during times of shortage, simply because we dare to use it for frivolous activities, such as cooking our dinner or turning up the central heating? My Mom had Alzheimer’s for the last 15 years of her life. Terrible disease. Thankfully my father has the means to pay for a personal care giver 24/7. Unlike many that have the disease my Mom’s personality never changed and she recognized all of her kids to the end. She was still the same Loving angle she had been all a long when she passed due to pneumonia December 3rd last year. Dad is still hanging in there. How tough it must be for those that don’t have the means to have 24/7 care. it was still a lot of work to keep all the meds straight for both of them and coordinate doctors visits and make sure all the necessary things were being done around the house. Our family is close and someone was always available to handle the stuff that came up. My sister, bless her heart, carried the largest part of the burden and was the one that hired and coordinated the care givers, two of which have simply been outstanding and like a part of the family. Both of my brothers are retired and live within easy distance to help out. Since I’m still working as a truck driver and thus on the road, I had less time to offer but did what I could. Some 30 years ago an acquaintance was living in a rented farm cottage in Aberdeenshire -himself, the wife and kids only used two fluorescent strips and a few 60 watt bulbs all turned off when not required – he’ installed a couple of wood stoves / Raeburn and had a diesel generator for 3-phase. Their mains electricity use was so low that they suffered a dawn raid from plod on suspicion of abstracting electricity. I wonder what the low usage trigger limit will be for smart meters once they get going? They might now be able to compare the meter reading from the substation with the total from all the smart meters attached to it. This would instantly show which areas need further investigation. Was this because the electricity supplier wasn’t visiting occasionally to check the meter before billing him? If he really was abstracting electricity the meter reader would have picked this up without involving the heavy arm of the law. Excellent thought. All those greenies who boast about reducing their electricity usage to minimal amounts should be raided by the police. Well in the land of fruits and nuts in San Francisco they outlawed wood burning in stoves and fireplaces so that is where the greens really want to go. This seems a ridiculous use of ‘Smart meters’, more wild exaggerations, an alert wouldn’t be soon enough for any help to be forthcoming. There are wireless medic alert bracelets or buttons exactly for that purpose. Even the fitness bracelets, adapted for this use would be a far better sensor. I don’t think the grid is going to be around long enough to worry about it. I think they only transmit a register reading every 30 minutes so limited detail. But I predict it will only be a matter of time before police use the data to help convict criminals like murderers. indeed – however I suspect that sometime, somewhere, someone will write a scholarly paper on the gender impact of smart meters – if they haven’t already – and somebody will be claim to be mis-gendered and complain to the police. “I would have thought a few simple CCTV cameras, linked to relatives’ smart phones, would be far simpler and more effective …” – and much more likely to result in a response, based on my own experience! These “experts” ought to have to live in the real world, like the rest of us. There is something iffy about this story. For it to make sense would suggest that there would be considerable real-time human monitoring with involvement by NHS staff and doctors, people not exactly readily available. It seems to be the opposite of a ‘Brexit Project Fear Story’, in other words a last-ditch attempt to justify the use of the EU-promoted Smart Meters, when common sense and the final cost will expose them as being over-rated and unwarranted? I wish that our feeble Government and civil service had the confidence to make a decision now and again, rather than bending the knee to the corrupt and wasteful EU Commission! A friend in the village was talking about this in the pub a few nights ago. He has been asked to be part of a pilot trial in this area. It will be interesting to hear how it goes. He is very open about his condition. Most of the time he is very sharp and clear but he admits that he has stopped driving because he can forget where he lives. He is married so I guess he will be a good test case because they can check any apparent alarms with his wife. The scheme appears to be well-intentioned (but we all know where that road can lead). Let’s not forget that this is aimed mainly at the very elderly who live alone. They may well not have a mobile phone or wi-fi. There can be no doubt that there are other and better ways of monitoring vulnerable people, as a number of correspondents have already mentioned. As long as this scheme is voluntary and can be cancelled at any time there’s possibly no harm in it but allowing the authorities to collect data for something seemingly harmless gives them a bank of information which might be used against the individual, bypassing pesky court orders. Here in Spain unexplained spikes in a home’s electricity use are reasonable grounds for a raid by the tax authorities who use it to prove unlawful letting and tax evasion. Spain’s (Europe’s) Napoleonic laws then allow them to extract the estimated debt or embargo the suspect’s bank account until the debt is paid who then would have to prove innocence and then reclaim the money in the extremely slow and inefficient court system. So much for the idea of personal liberty. I use Alexa which when Mum sets a timer for cooking her meals, it triggers an email to me with the duration of the timer(s) Very useful. I would be surprised if this kind of thing could be done without consent. Sh!t stirring always sells papers, well done for doing it for free. It’s a trial, but just a few points. The ten-secondly data is only available between the meter and a local device so for the purpose of this exercise and the future the patient will need to have a separate device in the home. It’s not something that can just be switched on for any customer as and when the companies feel like it. Your CCTV solution I think is a non starter- CCTV is a much bigger threat to privacy than an algorithm especially if theres a person watching it Anyone can do that and they’re free to do so but if it was easy people already would. You also have to watch that footage and be watched by that footage. Dementia patients are still entitled to privacy. This is just to see IF the data is effective at spotting problems automatically. Also, regarding being cut off in times of shortage, that’s already possible and always has been. By CCTV, I meant your own system linked to your family’s smart phones, not a public one. My daughter, for instance, has just such a system, with a couple of cameras outside her house so she can check her back door etc on her smart phone while away from home. Again something insiduous is introduced using emotion as leverage. If there is anyone who still believes that honesty, compassion and egalitarianism permeate our governments, I pity you when the daylight eventually dawns.